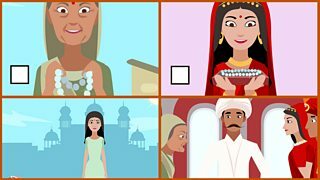 The traditional Hindu tale of Lakshmi and the Clever Washerwoman is told in two episodes. It is almost time for the festival of Diwali - when the goddess Lakshmi walks among the people - when the washerwoman finds the Queen's necklace on the bank of the river. When she finds out the necklace has come from the palace she knows she must return it...but how can she turn her find to her advantage? The Queen goes for a swim and her necklace is taken by a crow. Will she see it again? 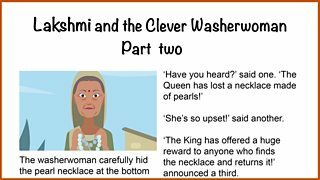 The washerwoman has found a precious necklace and wonders what she should do with it. 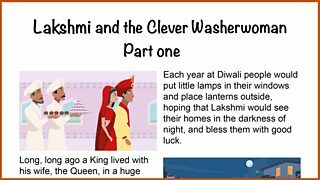 Read the illustrated text of Part one of Lakshmi and the Clever Washerwoman. Sequence the events of the story in the correct order. Download / print an A4 outline drawing of the palace. 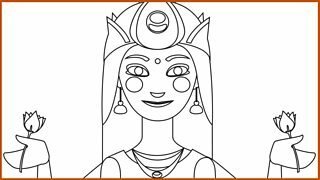 Download / print an A4 outline drawing of the goddess Lakshmi. 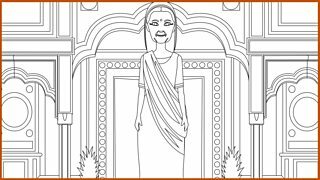 Download / print an A4 outline drawing of the wealthy washerwoman outside her new house. Long, long ago a King lived with his wife, the Queen, in a huge palace at the heart of a great city. 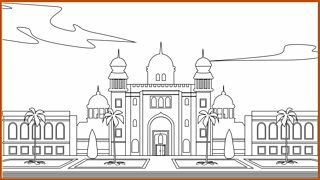 The palace was built of pink stone and stood in magnificent gardens, where palm trees swayed and peacocks roamed the perfect lawns. The King and Queen were getting ready to celebrate, for it was a special time of year. Tomorrow it would be Diwali: the festival to honour Lakshmi, the gentle goddess of wealth and good fortune. Each year at Diwali people would put little lamps in their windows and place lanterns outside, hoping that Lakshmi would see their homes in the darkness of night, and bless them with good luck. Every year, on the day before Diwali, the King would buy the Queen an expensive present. One year he had given her an elephant to ride around the palace gardens. Another year he had given her a sari covered in jewels. And this year the King’s present to the Queen was no less grand: a beautiful necklace made of pearls! ‘I can't wait to show it off to everyone!’ said the Queen, as she took her husband’s present without a word of thanks, for - in truth - she was rather rude and ungrateful. Each morning the Queen would go for a swim in a nearby river. Of course, she couldn't risk damaging her valuable necklace, so this morning when she arrived at the river, she took it off and left it on the riverbank under a bamboo tree. ‘It will be perfectly safe there,’ thought the Queen. ‘After all, no-one would ever dare to steal from the Queen!’ And with that she stepped into the cool water to swim. The Queen was quite right of course. No person would ever dare to steal from the Queen. But a crow isn’t a person and on this day a crow, perched on a branch in the bamboo tree, looked down and spied the necklace glinting in the sun. In a flash, it swooped down, grabbed the precious treasure in its beak and flew away. ‘Stop! Stop!’ cried the Queen - but it was too late! Away flew the crow, further and further, until it was gone from the Queen’s sight. Some distance away, another woman was also by the river. Like the Queen, this woman came to the river every morning but, apart from that, she couldn’t have been more different to the Queen. She was a washerwoman and every day she came from her home in the poorest part of the city to crouch down on the bank and wash clothes for the people who paid her. The washerwoman was scrubbing a sari when she looked up and saw a crow overhead. The crow had something glinting in its beak, something which the crow dropped, something which landed on the riverbank. The washerwoman could hardly believe it! There, right beside her, glinting in the sunlight, was a necklace! She picked it up, to look at it more closely. It was very precious - she was sure of that - why, it looked like it was made from real pearls! The washerwoman carefully hid the pearl necklace at the bottom of her clothes basket and set off for home. The washerwoman lived in a small hut in the poorest part of the city. It was a crowded, noisy place, where everyone knew everyone else. Keeping the necklace a secret wouldn’t be easy. As the washerwoman made her way to her door she could hear her neighbours gossiping. ‘She's so upset!’ said another. ‘The King has offered a huge reward to anyone who finds the necklace and returns it!’ announced a third. The washerwoman quietly slipped inside her home and shut the door. She didn't want her neighbours knowing she had the very same necklace in her basket! But now she knew who the necklace belonged to and she knew what she had to do. The washerwoman waited for her neighbours to go inside, then she slipped out and made her way to the palace. How grand the palace was with its pink stone walls, swaying palms, peacocks and perfect lawns! She knocked on the door and it was opened by a servant, who frowned at the washerwoman and was about to close it on her again, when she showed him the necklace. Immediately the washerwoman was taken to see the King and Queen. ‘You found my necklace!’ cried the Queen, as the washerwoman bowed her head and offered it to her. ‘And now for your reward!’ said the King. He clicked his fingers, and a servant entered with a pot full of gold coins. More money than the washerwoman had ever seen in her life! That evening the washerwoman looked out of her window. The next day would be Diwali, but the entire city was in darkness. Just as she had asked, there wasn’t a lamp or light to be seen, except one. The washerwoman lit a small candle, placed it on her door step - and waited. Lakshmi was just about to leave when she spotted a single light shining in the poorest part of town. Lakshmi went to the door and knocked. The door slowly opened. 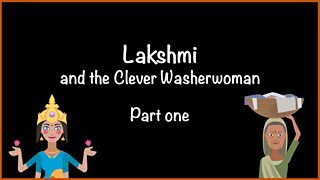 ‘Welcome, Lakshmi!’ said the washerwoman. ‘May I come in?’ asked the goddess. 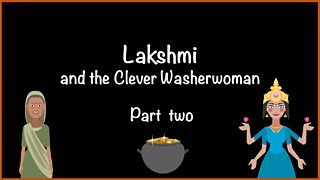 Lakshmi looked at the washerwoman. In the entire city she was the only one to have lit a lamp in her honour. ‘I shall grant you your wish,’ she said with a smile. Lakshmi was true to her word. From that night onwards, the washerwoman and her family were blessed with good health, good luck and happiness for many years to come.